X-Ray Gold Testing Machine for Hallmarking Centers - Fischer Measurement Technologies India Pvt. Ltd. The high-end measurement system Fischerscope X-Ray XAN SDD was developed specifically for non destructive, high precision analysis of thin gold and precious metal coatings. Gold testing machine in hallmarking centres: XDV-SDD is engineered under the firm direction of expert quality controllers. These are basically X-ray fluorescence measuring instrument with a programmable XY-stage and Z-Axis for Automated Measurements of very thin coatings and for trace analysis. These are extensively used as an energy-dispersive X-ray fluorescence measuring instrument for the measurement and analysis of very thin coatings or small concentrations in the trace analysis. These are universally applicable energy-dispersive X-ray fluorescence measuring instrument widely used for measuring and analyzing very thin coatings or small concentrations in the trace analysis. 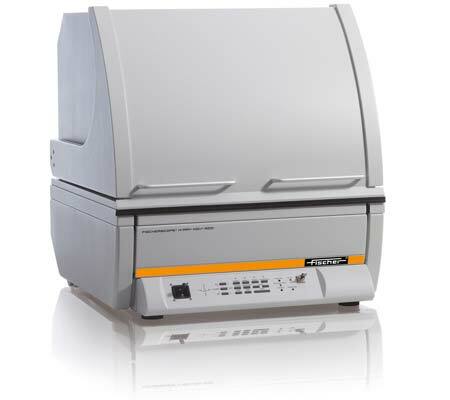 These have programmable XY-stage, which make these perfect for auto-mated sample measurements. These are featured with electrically changeable apertures and primary filters and modern silicon drift detector to ensure high accuracy, good detection sensitivity, long term stability and outstanding accuracy. These are widely recommended by clients owing to its precise design, robust design, longer service life and effective usage. These are user-friendly bench-top instrument equipped with programmable XY-stage and an electrically driven Z-axis for automatic measurement. These are also fitted with a laser pointer, integrated video-microscope with zoom, protective hood and cross-Hairs simplifies sample placement for perfect measurement. These are operated using the powerful and user-friendly WinFTM® software, for entire operation and evaluation of measurements as well as the clear presentation of measurement data is performed on a PC. illumination, laser pointer (class 1) to support accurate sample placement. FocusingAuto-focus and manually controlled motor focus. Manual adjustment of the focal plane in a range from 0 to 80 mm. Repeatability precision XY unidirectional: ≤ 5 μm (0.2 mils) max., ≤ 2 μm (0.08 mils) typ.